Saturday allocation changed from RM to RT. Saturday extended from Farringdon Street to Waterloo. Extended from Tufnell Park to Archway Station and reverted from DM to RM vehicles. Withdrawn between Farringdon Street and Waterloo except for Mon-Fri peaks. Extended from Farringdon Street to Waterloo Mon-Fri evenings. Extended from Finsbury Park to Archway Station. London Buses was divided into 12 business units - in preparation for sell-off. HT allocation transferred to CF - and M type vehicles changed to T type. 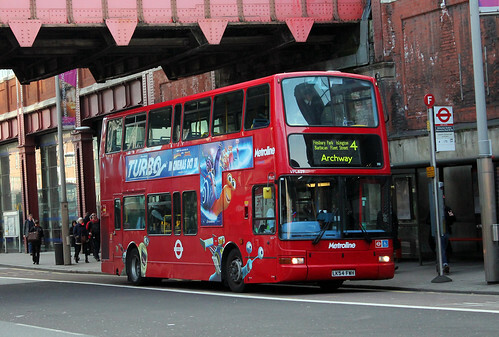 Sunday Route introduced between Archway and Islington from HT garage. CF allocation transferred to HT. Low floor double deck operation commenced. Sunday extended from Islington to Waterloo. Changeover point at Archway ?